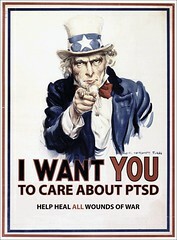 I am a psychiatric nurse with a specialization in PTSD/Combat Stress (Masters Degree from UIC focused on PTSD). I work full time in the civilian sector as the Behavioral Health Clinical Team Leader at a disease management company, but I also served as a Reserve Officer in the US Army Nurse Corps. I just separated from the Army 3 weeks ago, but up until then, I served as a Captain and was conducting briefings and debriefings for Soldiers as they were going over and coming home (medical teams, mostly, but I've trained a section of the 85th Custer Division, too). And in so doing, I have heard a lot, and learned a lot, about what they face when they come home. I put together a PowerPoint about what they face when they return, and in January sent it to 16 friends/family members. It has now made it around the world and back, much to my utter astonishment. Not only using visual outreach to educate, Alison's also been laying the foundation for a Chicago-area organization aimed at educating "civilians across America about the psychosocial impact of war on the returning Service Member, and to assist American communities in understanding, supporting, and reintegrating our Veterans." 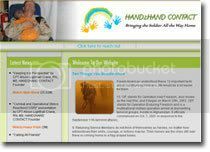 Hand2Hand Contact is now online, and I invite you to take a look at the offerings she's put together for us. In addition, Alison passed along an important program slated to begin in August in select cities (Sacramento, CA; Hartford, CT; and in Dallas/Fort Worth, TX) which will lend a hand to troops returning with traumatic brain injury, or TBI. Do you think you may have sustained a Traumatic Brain Injury (TBI) while serving in Iraq or Afghanistan? Easter Seals invites service members and veterans who may have sustained mild to moderate TBI to take part in a support program that is designed to improve brain function for service members returning from Iraq or Afghanistan. The program is offered free of charge to participants and is part of a service project involving Easter Seals and Posit Science. A disability rating is not needed to participate. Sign up now. The program begins in August and runs for 14 weeks at Easter Seals affiliates in: Sacramento, CA; Hartford, CT; and in Ft. Worth/Dallas in TX. Participants who complete the program will receive a modest stipend and reimbursement for program-related expenses. For more information, please call our toll-free number: 866.423.4981 or contact us at: veterans@easterseals.com. Thanks, Alison, for everything you're doing. Great to have such a qualified and passionate ally in this cause! Hopeful video describing the recommendations for change in the veterans' disability claim and aftercare system by the Dole-Shalala Commission on Care for America’s Returning Wounded Warriors. There will soon be two Veterans Readjustment Centers in the Valley. These facilities help retuning veterans who suffer from post traumatic stress disorder. They also help the families and provide bereavement counseling. As part of the Carl T. Hayden Veterans Affairs Hospital, these centers also need need volunteers. The first has been open for some time at 77 E. Weldon Ave., Suite 100, in Phoenix. The second will open Aug. 1 at 1303 S. Longmore, Suite 5, in Mesa. The public is invited to the center's grand opening at 10 a.m. Besides volunteers, items to furnish and decorate the new office are needed. For information on the Mesa center call Darlene Tryon at (480) 610-6727 or e-mail darlene.Tryon@va.gov. To reach the Phoenix center, call (602) 640-2981. A recent post introduced you briefly to her programs; look for the latest offerings in our events listing or learn more on Merritt's retreats at their Welcome Home Program for Returning Combat Veterans page. In addition, another special guest that thrilled me by his presence was Dr. David B. Monier-Williams, a psychotherapist, bio-energetist and spiritual counselor who sprang to action after reading an article (imagine that...) to offer complimentary counseling services to area female veterans. Kudos to Arizona for these great resources! When looking at the data on the strain of extended deployments and the special stresses of 'weekend warriors' vs. that of the active forces, it's obvious the state's leaders felt the need to be proactive in ensuring their citizen soldiers' reintegration goes as smoothly as possible. But proactive homecoming measures aren't always enough to counterbalance months on end away from family and sanity and moments of relaxation. * Arriving home this week vs. last, the Iowa National Guard also completed a 22-month deployment. I guess the Minnesota Guard's distinction of being the longest-deployed guard unit didn't last too long. Sigh. Maj. Gen. Larry Shellito commands the Minnesota National Guard. He calls the four-month extension a sucker punch, and says it will make re-entry exceptionally difficult. "The problem is when they come back home, they'll get the hugs and kisses, they'll drink their favorite beer they couldn't drink over there," Shellito said. "They'll get mama's favorite meal cooked for them two or three times, then, about a week later, everyone goes back to work, kids go back to school, and they're home alone." And alone can really mean alone in rural Minnesota. The 1st Brigade Combat team comes from 87 of the state's 89 counties, many of them quite isolated. Normal military policy gives a soldier a full 90 days off to reconnect at home after deployment. But Minnesota isn't taking any chances. Soldiers will be required to check in several times over those three months. Families can't always spot emerging psychological problems, Shellito said. "Mama can't look him in the eye, wife can't look him in the eye. She'll know something's wrong," Shellito said. "But I'll tell you those buddies, those battle buddies — they'll know when he's happy, sad, lying, whatever." Minnesota Sen. Norm Coleman and Gov. Tim Pawlenty are urging the Defense Department to change a policy aimed at giving some breathing room to returning National Guard and Reserve troops, saying it prevents some soldiers from getting the kinds of integration services they need. The policy exempts returning soldiers from being called for mandatory activities for 60 days after they return home from combat, although it does allow the military to organize voluntary activities for the troops. Coleman and Pawlenty, both Republicans, argue that policy doesn’t reach soldiers who are at risk. "The guys with the problems are often the guys who don’t want to come back and have the conversation," Coleman said in a telephone interview Monday. "It’s an intervention thing." Although most soldiers returning from combat do fine, others face challenges and stresses, Coleman said. "It’s team members and commanders and unit members, they’re the ones who can say, ’Hey, I think you need to talk to someone,’ he said. "And that’s why the mandatory becomes pretty important." Coleman recently was quoted saying, "We are going to be in Iraq a long time." If he thinks that's true -- and he's not against it -- he must defend it. Minnesota won't like it. Seventy percent of Americans want the troops home by next spring, and in Minnesota, where there is a palpable sense of relief over the return of 2,600 National Guard soldiers from Iraq, the percentage is probably even higher. Even Gov. Tim Pawlenty has begun to show some exasperation. After welcoming the returning troops, he came close to criticizing the Pentagon for extending their duty and giving the Minnesota Guard the dubious distinction of having served the longest uninterrupted periods of any soldiers who have been deployed to Iraq. But like the Scandinavian who loved his wife so much that he almost told her, Pawlenty was so upset he almost said so. When he becomes chair of the National Governors Association soon, he said, he will push for "consistency" in Pentagon deployment practices. Of course, the Pentagon might achieve consistency by extending all deployments to the length Minnesota's soldiers served. That won't help. The problem is the regular Army is overextended, the National Guard has been abused (and its strength in many states depleted), all to prop up a last-ditch effort to keep Iraq from falling apart in a civil war. An Iraq War veteran reported missing a few days earlier was found dead of an apparent suicide, according to the St. Louis County Sheriff's Office. Noah Charles Pierce, 23, was last heard from Wednesday afternoon when he left his Mountain Iron home. His body was found Friday in the Gilbert area. He reportedly left his home carrying several firearms, authorities said. Several of Pierce's friends told authorities that he had sent them text messages indicating that he was suicidal. The sheriff's office said Pierce had been diagnosed with post-traumatic stress disorder. Authorities had indicated before he was found dead that Pierce may have been a danger to himself and others. This Minnesota tragedy comes on the heels of a highly-charged January incident; another returning veteran had taken his own life after being turned away from one VA facility and put on a long waiting list at another. With this latest case, Minnesota alone has tracked at least 14 cases of suicide of returning troops. Extrapolate that to 50 states, and that would equal at least 700 OEF/OIF troops that may have taken their own lives after returning home safely from Mideast combat zones. Of course, this isn't a concrete figure; we have no idea how many post-deployed troops have killed themselves. The DoD isn't tracking such cases. And neither is the VA. But, along with my collaborators at ePluribus Media, we are in the PTSD Timeline, wishing with each case that it would be the last. Steve Robinson, director of government relations for Veterans for America, told them he was particularly disturbed by suicides in the war zone because combat troops are supposed to be screened for mental health issues before they join the military, and throughout their careers. "These people aren't the kind of people that you would think would take this step," he said. The parents of a former Marine who hanged himself in his Belchertown home after returning from the Iraq war sued Secretary of Veterans Affairs James Nicholson yesterday, contending negligence at the Northampton VA Medical Center led to their son's death. Kevin and Joyce Lucey, in a 27-page complaint filed in U.S. District Court, allege that the refusal by medical center personnel to admit their emotionally troubled son, 23-year-old Jeffrey M. Lucey, on June 5, 2004, caused his suicide less than three weeks later. Kevin Lucey said yesterday afternoon that the couple was reluctant to bring the lawsuit, which also names the United States as a defendant, but he said the medical treatment of the country's veterans needs an overhaul. "At this point, we want to make sure nobody else has to follow our path," he said. "He (Kevin Lucey) wants to feel that his son died for something," said Conway lawyer Cristobal Bonifaz, who represents the couple. Kevin Lucey was told by medical center personnel that he needed to bring his son to the Northampton facility, as it appeared he was suffering from post traumatic stress disorder, according to the complaint. Jeffrey Lucey was involuntarily committed to the medical center on May 28, 2004, and released four days later. "They never assessed him for PTSD," his father said. "They said they wouldn't assess him due to the fact that he would have to get his drinking under control." When family members brought Lucey back to the medical center on June 5, 2004, according to the suit, personnel refused to have him evaluated for possible admission even though his sister, Debra, "expressed her concern ... that, unless something was done, she feared her brother would not be alive by July of 2004." Seventeen days later Kevin Lucey found his son hanging from a beam in the cellar of the family home. He had used a hose to hang himself. The suit states that a report into Lucey's death issued by the Office of the Inspector General of the Department of Veterans Affairs concluded that a psychiatrist at the medical center should have been consulted before Lucey was denied treatment on June 5, 2004. The lawsuit follows the announcement last week by Nicholson what he would resign effective Oct. 1 and the filing of a suit by the Veterans for Common Sense on Monday in federal court in San Francisco. The suit, filed against the U.S. Department of Veterans Affairs, alleges the agency is unlawfully denying veterans disability pay and treatment. From Monday's PBS News Hour, a look at the limitations in the present disability ratings system in providing adequately for 'invisible' injuries such as pain, traumatic brain injury [TBI] and post-traumatic stress disorder [PTSD]. According to Taft, U.S. National Guard and Reserve members are deploying at higher rates than ever in history, leaving behind spouses in rural settings without the full support of the military. “Deployment to a combat zone is a major stressor for soldiers and their families and may exacerbate existing levels of stress for spouses. bringing about changes in coping strategies” said Taft. For this research, Taft would like to interview spouses of National Guard or Reserve soldiers who are soon to be deployed, currently serving, or returned from Iraq or Afghanistan within the past year. She said the interview takes about 60 minutes and can take place in participants’ homes or at other locations convenient for them. Interviews will be tape recorded, but information will not be connected to individual participants and the names of all participants will be kept confidential. Contact Taft at taftlb@uwec.edu or (715) 836-4911 to take part in the study. At least 40 percent of State Department diplomats who have served in danger zones suffer some symptoms of post-traumatic stress disorder, Steven Kashkett, vice president of the American Foreign Service Association, said in congressional testimony yesterday. Troubling medical and psychiatric symptoms have become a growing problem for Foreign Service personnel in recent years, particularly among those exposed to deadly violence in countries such as Iraq and Afghanistan, where diplomats often work and live among U.S. troops, Kashkett told a House Foreign Affairs subcommittee. This month, however, the State Department launched the first survey of all State personnel who have served since 2002 in "unaccompanied posts," or areas deemed so dangerous that family members are not allowed. The one-month survey is being carried on the department's internal Web site, and responses are anonymous. So far, half of the respondents said they experienced irritability and unusual hostility, and 35 to 52 percent said they suffered from one or more symptoms common to PTSD -- including social withdrawal, isolation, apathy, insomnia and anxiety -- during or after their assignments. In Iraq, many Foreign Service personnel have been exposed to frequent incoming fire in the Green Zone and sleep in vulnerable aluminum trailers, he told the subcommittee. Others live on forward operating bases in the midst of combat areas, while members of the provisional reconstruction teams are embedded with mobile combat units and are as susceptible to roadside explosives and attacks as U.S. troops, Kashkett said. "In the Valley of Elah," an upcoming film by Paul Haggis ("Crash") that I shared news of last week, offers tomorrow's New York Times a chance to explore the coming stream of films dramatizing the more personal aspects of our current wars in Afghanistan and Iraq. Such films allow us to reflect on war's effects on both society and the warriors sent to fight on our behalf, as well as how the families that wait for their return home cope with the experience. From "Hollywood Quickly Bringing the Iraq War Home:"
On Sept. 14, Warner Independent Pictures expects to release “In the Valley of Elah,” a drama inspired by the [recently-returned Iraq vet Richard R.] Davis murder, written and directed by Paul Haggis, whose “Crash” won the Academy Award for best picture in 2006. The film stars Tommy Lee Jones as a retired veteran who defies Army bureaucrats and local officials in a search for his son’s killers. In one of the movie’s defining images, the American flag is flown upside down in the heartland, the signal of extreme distress. Movies have the power to present difficult social or personal problems, offering the viewer an educational benefit alongside the usual entertainment value. Movies can bring the viewer closer to topics that are often hidden away from the general public's gaze. Haggis insisted that “Valley of Elah” — the title refers to the site where David fought Goliath — was not intended to enforce his point of view. Rather, he said, it is meant to raise questions about “what it does to these kids” to be deployed in a situation where enemies are often indistinguishable from neutral civilians, and the rules of engagement may force decisions that are difficult to live with. Despite some obvious fictionalization — the Fort Benning case did not involve the authority-challenging local detective and single mother played by Charlize Theron — the film hews closely enough to fact that Mr. Haggis is considering a dedication to Specialist Davis. The question of sensationalizing a point can often be raised when using the more dramatic incidents in life to try to tell a story. Ilona Meagher, who wrote “Moving a Nation to Care: Post-Traumatic Stress Disorder and America’s Returning Troops” (Ig Publishing) and has joined Warner’s promotional effort, acknowledged that the Davis case was among the most extreme of some 170 stress-related episodes she had documented since 2005. “We all know that human beings respond/are moved by stories that are more extreme in nature,” Ms. Meagher wrote in a follow-up e-mail message. Yes, the incident that the film is based on is a rare case -- one of extreme violence -- an outlier. But it's important to understand why such incidents are used in the first place. As I said in the quote, human beings respond/are moved by stories that are of a more extreme nature; storytellers of all kinds throughout the ages gravitate towards the more poignant and dramatic for that reason. Opera, for example, deals with extreme tragedy in order to move its audience to *feel* something powerful and real. This movie is no different. The reality is that had the incident portrayed in the film ended in the soldier's merely being beaten up, we wouldn't even be talking about it, would we? Mark Boal probably wouldn't have written his "Death and Dishonor" piece that "Valley of Elah" germinated from. And Paul Haggis probably wouldn't have been moved enough to make a movie around it. The hope, always, in such efforts is that good can come of the bad, that suffering was not in vain and that, with effort and attention, we might move our nation to caring about these faceless individuals in uniform returning from war as much as we care about our Hollywood starlets or championship athletes. As the Senate approved -- by unanimous consent -- its Wounded Warrior package (see details below the fold), the long-awaited draft recommendations stemming from the presidential commission set up in the wake of the Walter Reed scandal were made available online [MS Word]. Calling its recommendations a “bold blueprint for action” to serve, support and simplify the care for our injured service members, the President’s Commission on Care for America’s Returning Wounded Warriors today approved six recommendations that make sweeping changes in the delivery of health care and services. The recommendations include the first major overhaul of the disability system in more than 50 years; creation of recovery plans with recovery coordinators; a new e-Benefits website [PowerPoint]; and guaranteeing care for PTSD from the VA for injured service members from Iraq and Afghanistan. The nine-member Commission called upon the White House and Congress to implement its recommendations as quickly as possible to ensure that those who have served in Iraq and Afghanistan are able to successfully transition back to civilian life or active duty service. If adopted, the commission’s recommendations would radically overhaul the current system, described by the commission as a “patchwork of programs, rules and regulations” that has become “tremendously complex” and often leads to “real or perceived inequities.” Of 35 total recommendations — only two of which were directed specifically at Walter Reed — just six would require legislation. The other 29 can be acted upon by the Pentagon or Veterans Affairs Department. The commission also recommended making veterans eligible for transition payments after leaving the service. Those returning directly to their communities would receive short-term payments equaling three months of basic pay, as well as Tricare coverage for themselves and their families. Those taking part in VA education and training programs would receive longer-term payments. They also would be eligible for payments for earnings loss, to make up for reduced earning capacity, and quality-of-life payments to compensate for permanent physical or mental losses. The rating system itself would be streamlined with a single, comprehensive, standardized medical exam administered by the Defense Department. Based on the results of that exam, defense officials would determine fitness for duty and VA would determine the initial disability level. The proposal resembles a Pentagon initiative announced last week. The commission wants the Pentagon and VA to create integrated care teams of doctors, nurses, other health professionals, social workers, and vocational rehabilitation workers who would implement the recovery plan, all under the purview of a recovery coordinator — a single point of contact for patient and family. According to figures provided by the commission, 3,082 of the 28,000 troops wounded in action are considered seriously wounded — that is, they have been awarded Traumatic Servicemembers’ Group Life Insurance, a one-time payment that varies with the severity of the injury. Of these, 2,726 have suffered a traumatic brain injury; 644 are amputees; 598 have serious burns; 391 are “polytrauma” victims; 94 suffered spinal cord injuries and 48 have been blinded. "Making the significant improvements we recommend requires a sense of urgency and strong leadership," [the recommendations] said. Bush said his hand-picked investigative panel had interesting suggestions on improving health care for those wounded in battle. But the White House said not to expect action right away. Paul Rieckhoff, executive director of Iraq & Afghanistan Veterans of America, agreed. "It is important for the American public to understand that the Walter Reed fiasco is not over," he said. "Everything is not fixed. The follow-through will be the most important part." Secretary of Veterans Affairs Jim Nicholson today thanked the members of a special presidential commission for their work examining the federal government's response to the health care needs of returning combat veterans. "We at VA are caring for the whole veteran," Nicholson said. "I look forward to reviewing the commission's final report as we work to improve our efforts to return our wounded warriors to full function, while helping all veterans receive the jobs and educational benefits they deserve." allowed gaps in coverage and medical treatment. 10 am EST - House Veterans Affairs Committee full committee hearing "PTSD and Personality Disorders: Challenges for the VA"
Join me at ePluribus Media for an exclusive online Q&A with Melissa Kasnitz and comments posted by Jeff Peskoff. The House Veterans Affairs website has an audio stream available of the hearing -- unfortunately, C-Span does not appear to be carrying this important hearing. Nonetheless, it looks (or rather sounds) like a blockbuster gathering -- and important -- hearing, so it would be well worth your time. "I'm not saying PTSD doesn't exist, but it's gotten out of hand. I mean, if you see a lot of action and then you come home you have a hard time walking your dog by the bushes at night, maybe you just avoid the bushes." Since his discharge in 2006, Town has not only dealt with the emotional scars of war, but he has also found himself at the center of a national debate on mental health care for veterans as a crowd as diverse as singer Dave Matthews [video] and members of Congress has questioned how 22,000 veterans were diagnosed and discharged since 2001. Since October 2001, the services have discharged 24,723 troops under the character and behavior disorders policy. In 2006, 3,937 servicemembers were dismissed under the policy, up about 8 percent from 2005 but just above the 3,899 servicemembers dismissed in 2002. In Town's case, the discharge came two years after he was injured in an attack. In the fall of 2004, a 107 mm rocket ripped through his unit's headquarters in Ramadi, exploding two feet above Town's head and knocking him unconscious. The rocket blast left Town with hearing loss, headaches, memory problems, anxiety and insomnia. For his wounds, he was awarded the Purple Heart. But when he returned to the states seeking treatment for those very wounds, the Army quickly discharged him, asserting his problems had been caused not by the war but by a personality disorder that predated his military career. ... "When you see bits and pieces of actual people or people bleeding to death or anything, it's very unsettling. It's something you'll never be able to forget. Period," Town told ABC News' Bob Woodruff. [UPDATE July 28, 2007]: Listen to Westwood One's America In the Morning show for an interview with Jonathan Town and reporter Joshua Kors. ABC News ran a report by Bob Woodruff last week that renewed interest again on the issue of combat troops being given personality disorder vs. post-traumatic stress disorder diagnoses/discharges. Woodruff (who you might recall did some ground-breaking reporting on the traumatic brain injury, or TBI, issue earlier this year) conducted a two-month investigation, interviewing 20 soldiers discharged with personality disorder for the piece. And today, we have this hearing in response. [UPDATE Oct 6, 2007]: This House Committee on Veterans Affairs page links to all of the day's testimony. WEDNESDAY, JULY 25th IN WASHINGTON, D.C.
recommendations to the President concerning care for America’s returning injured and wounded servicemen and women. The Commission held its first public meetings on April 14th and has since conducted 23 site visits and held seven public meetings. Atrium Ballroom, 14th Street and Pennsylvania Avenue, N.W., Washington, D.C. The tireless combat PTSD advocate Kathie Costos, editor of Nam Guardian Angel, shares this 20-minute tribute to veterans who have fallen as a result of suicide. While the individuals remembered include a handful of coalition troops, the majority that flash before us are our American brothers and sisters. Keeping their families in our hearts, keeping their memories in our minds -- and using the lessons they've taught us to direct our energy towards ensuring those returning home today reject such a fate. Thank you, Kathie, for the work that you do. The Merritt Center is offering a special retreat program for combat veterans. With the assistance of mentors, who are veterans themselves, and healing practitioners; returning vets will open the program with a Talking Circle to begin to release the experiences of war and to begin to create the dream of a new life. Vets4Vets is a non-partisan veterans’ peer support organization dedicated to helping Iraq and Afghanistan era veterans feel good about themselves and heal from any negative aspects of service and war. As a national community of Iraq-era veterans who have served post 9/11, in weekend workshops, one-on-ones and local groups, Vets4Vets allow veterans to take equal and uninterrupted turns sharing their experiences and expressing their feelings in a truly confidential setting. Over 300 Iraq-era veterans have attended one of our ten workshops in the last year. Many of them have returned to their home communities after these workshops and reached out to their peers to begin setting up Vets4Vets projects around the country. Travel, lodging and meals will be provided. Applications (links below) must be submitted to Jason Ridolfi at vets4vets@gmail.com. Priority will be given to OIF/OEF vets, especially those who have not yet attended a Vets4Vets workshop and to those who are interested in setting up and leading local Vets4Vets support groups. A few veterans from earlier conflicts will be invited as allies to help set up Vets4Vets programs in their organizations or communities. Redefining PTSD as a soul wound, clinical psychotherapist Dr. Edward Tick offers hope by nurturing a positive, mature warrior identity for our veterans. He has been speaking nationally about the psycho/spiritual needs of veterans since the release of his acclaimed book, War and the Soul: Healing our Nation’s Veterans from Post-traumatic Stress Disorder. This intensive healing and training workshop will provide experience in the groundbreaking techniques he has developed for over two decades and introduces in his book. He draws on methods from ancient Greek, Native American, Vietnamese, and other traditions to restore the soul so that veterans can, at last, find inner peace and truly return home to themselves, their families, and their communities. The workshop is open to veterans and their families, counselors, therapists, and members of the clergy. Participants will find Dr. Tick’s work invaluable for veterans of any war as well as for all who love and would help them. The workshop is co-sponsored by Quest Books and Soldier’s Heart, an organization Dr. Tick recently founded in Albany, New York for veterans’ healing. It will be held September 13-16th, 2007 at the Olcott campus of the Theosophical Society, 1926 North Main St., Wheaton, Il. Sign-in will begin at 3:00 p.m. Thursday. Dr. Tick will begin the workshop Thursday evening at 7:00 p.m. and conclude at noon Sunday. Registration fee is $395, excluding meals and rooms. Limited accommodations are available on campus; additional rooms are reserved at the Hampton Inn, 205 W. North Ave., Carol Stream, Il., (630) 681-9200. A very limited number of scholarships will be available. For more information go to www.soldiersheart.net. To register, or if you have questions, please call Christine Pomeroy: 800-669-9425, ext. 350, or email cpomeroy@theosmail.net. What are the issues facing our veterans? How can we truly support our troops as they come home? What helps with healing? What hinders healing? What veteran’s services and resources are available? Let’s explore these questions, hear their stories, and educate ourselves so that we can respond better to the needs of our veterans, their families and all those affected by war. * There is a UMass football game at noon. Expect traffic. From Rt 9 East, turn left onto N. Maple Street at the lights near the Hampshire Mall. The church is ½ mile on the left. Sponsors include Amherst Interfaith Service Council, Hampshire Interfaith Council, Veterans Education Project and Wesley United Methodist Church. This is a non-political event open to members of all faith communities. Can't attend any of these? Find others on our events list. Frustrated by delays in health care, a coalition of injured Iraq war veterans is accusing VA Secretary Jim Nicholson of breaking the law by denying them disability pay and mental health treatment. ... The class-action lawsuit against the U.S. Department of Veterans Affairs, filed Monday in federal court in San Francisco, seeks broad change in the agency as it struggles to meet growing demands from veterans returning home from Iraq and Afghanistan. Suing on behalf of hundreds of thousands of veterans, it charges that the VA has failed warriors on several fronts -- from providing prompt disability benefits, to adding staff to reduce wait times for medical care to boosting services for post-traumatic stress disorder. The lawsuit also accuses the VA of deliberately cheating some veterans by allegedly working with the Pentagon to misclassify PTSD claims as pre-existing personality disorders to avoid paying out benefits. The VA and Pentagon have generally denied such charges. [A]ttorneys for the plaintiffs say the VA is "structurally unsuitable" for dealing with post-traumatic stress disorder, which the lawsuit [pdf] calls "a signature problem of veterans" of the current ongoing wars. ... About 1.6 million men and women have served in the two countries. A recent report by a special Pentagon Task Force found that 38% of soldiers and 50% of National Guard members coming home from Iraq or Afghanistan have mental health issues, ranging from PTSD to brain injuries. Only 27 of the VA's 1,400 hospitals around the country have inpatient PTSD programs, the plaintiffs' lawyers said. "A number of veterans have committed suicide shortly after having been turned away from VA facilities either because they were told they were ineligible or because the wait was too long," the lawsuit states. The proposed class includes all veterans with stress disorder, stretching back to those from the Vietnam War, as well as those who served in Iraq and Afghanistan. "Since the Iraq and Afghanistan wars began, the VA has betrayed our veterans," said Paul Sullivan, executive director of Veterans for Common Sense, based in Washington D.C. "Instead of hiring more doctors and claims processors, the VA instituted new policies that block veterans' access to prompt mental health care. "While we are reluctant to file suit against the VA, it is the VA's anti-veteran policies that leave us no other option than to fight for what our veterans earned after fighting on the front lines in Iraq and Afghanistan," Sullivan said. This class action does not seek money damages, nor does it address the claims of any individual veteran. It seeks systemic relief for the flawed system of providing heath care and benefits to veterans. Currently, there is a backlog of over 600,000 cases in the veterans benefit system, and veterans with PTSD are not able to promptly get treatment for mental health problems, despite a statute that requires free healthcare for two years after service. We are asking to the courts to order VA to fix these problems. [G]overnment investigators warned as early as 2002 that the VA needed to fix its backlogged claims system and make other changes. Yet, the lawsuit says, Nicholson and other officials still insisted on a budget in 2005 that fell $1 billion short, and they made "a mockery of the rule of law" by awarding senior officials $3.8 million in bonuses despite their role in the budget foul-up. The lawsuit cites violations of the Constitution and federal law, which mandates at least two years of health care to injured veterans. The veterans groups involved in the lawsuit are Veterans for Common Sense in Washington, D.C., which claims 11,500 members, and Veterans United for Truth, based in Santa Barbara, California, with 500 members. Disability Rights Advocates (DRA) is interested in hearing from veterans with Post Traumatic Stress Disorder who served in Iraq and/or Afghanistan. We are investigating the experiences of these veterans as they seek benefits through the Department of Veterans' Affairs. We are seeking information on how the existing system serves veterans, including whether or not they are satisfied with the speed that their claims are addressed and the outcomes. We also are interested in hearing from veterans about the quality of care they receive at VA facilities. We encourage any Iraq or Afghani veterans with PTSD who are interested in sharing their experiences to contact us. You can call, write, or email us at: Disability Rights Advocates, 2001 Center Street, Fourth Floor, Berkeley, CA 94704, (510) 665-8644; veterans@dralegal.org. Collect calls will be accepted. Additional comments, and a visit by Melissa Kasnitz of Disability Rights Advocates, in my Daily Kos and my exclusive Q & A at ePluribus Media. If you have an account over there, feel free to leave your questions/concerns for her; or leave them in comments here. I'll be happy to forward them to to DRA for you.